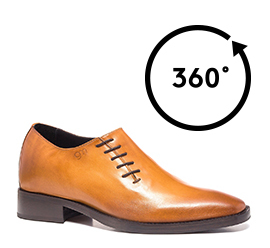 Stylish and luxurious dress shoes with upper in cognac calfskin, hand-buffered featuring particular side lacing. A handcrafted wholecut shoe with a modern design. The real leather sole is sewn at sight. The invisible inner elevator system is able to increase height from 2.4 (6 cm) up to 3.1 inches (8 cm) in total secrecy.